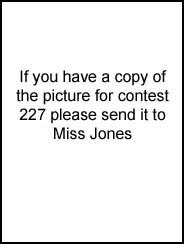 Caption: Miss Jones fully subscribes and participates in this day. And as she says "nothing thong in it and it is such brief day and passes in a flash"!! Caption: This is cute, it's one step up from my birthday suit. Caption: This is my winning technique at tennis. Caption: I hope I am dressed alright when We go out flashing tonight? Caption: "These are my Connie Jones knickers and not my Bridget Jones Bloomers"! !